The Met Office is predicting large parts of Scotland will be met with strong winds on Friday. Members of the public have been told to be prepared with strong winds forecast to sweep the north of Scotland this week. 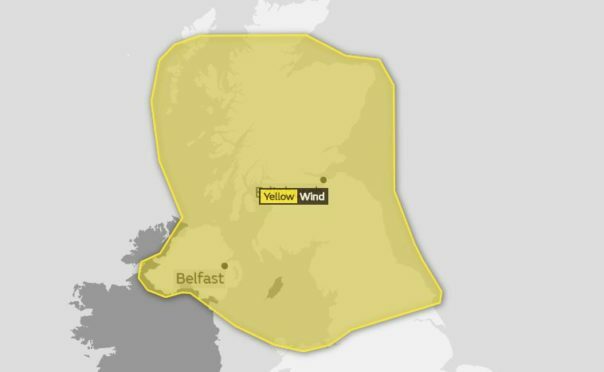 The Met Office has issued a yellow weather warning with the “very strong” gusts of up to 80mph expected to land on Friday. The forecasters’ alert covers practically the whole of Scotland south of Ullapool, and stretches as far south as Liverpool and Wales. It follows the issuing of an ice warning for parts of the north and north-east for this morning. Meteorologists say there is still “uncertainty” about exactly where the worst winds will be experienced, but are predicting 80mph gusts in exposed locations. Elsewhere “widespread gales” of 60 to 70mph will be possible, with heavy rainfall adding “an additional hazard”. The Met Office said the bad weather could lead to the cancellation of road, rail, air and ferry services, with the potential closure of some roads and bridges. A spokesman said: “There is a slight chance of some damage to buildings, such as tiles blown from roofs. It has also warned that power cuts could also occur. The yellow weather warning is in place from 3am until 11.59pm on Friday.